The JazzAmp 310 is the ideal for jazz guitarists who require who require a versatile feature set in an easy-to-transport package. The 10" Eminence Beta driver combines with a defeatable Eminence tweeter for an even, full range response. Improved AC filtering and a more adjustable input gain control provide clean, distortion-free operation no matter your pickup choice. An combination XLR and 1/4" input jack provides 48v phantom power for microphones and active pickup systems, and the low-impendance line out makes this perfect for recording and integrating with larger PA systems. Henriksen The BLU. 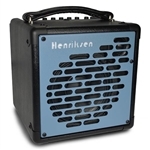 Single channel 12-pound version of Henriksen's The BUD amplifier. The tiny amp that does so much...and even more! And now includes FREE gig bag!